Lunar Standard Time (LST) - What time is it on the Moon? The first day of the Lunar year, is named Armstrong after the first human being who set foot on the Moon's surface; Neil A. Armstrong. 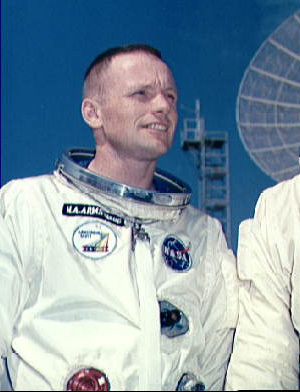 Armstrong stepped down from the LM ladder onto the Moon at 1-01-01∇ 00:00:00 LST. Armstrong was commander of Apollo 11, the first manned lunar landing mission, and gained the distinction of being the first man to land a craft on the Moon and the first man to step on its surface, with the words: "That's one small step for man, one giant leap for mankind." Left at the landing site, in the Sea of Tranquility, the plaque on the LM descent stage has the inscription: "Here Men From Planet Earth First Set Foot Upon the Moon. July 1969 A.D. We Came In Peace For All Mankind."